Augustus and Agrippa, both born B.C. 63 where very close friends form boyhood. Agrippa was destined by Augustus to succeed him, but he pre-deceased the Emperor in B.C. 12. 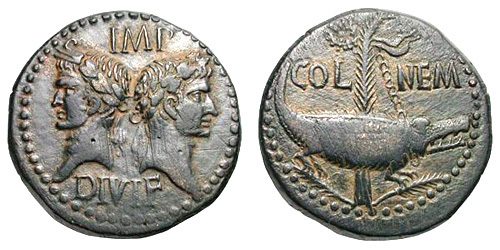 Obverse: IMP/DIVI F above and belows heads of Agrippa (to left) and Augustus (to right) back to back, that of Agrippa wearing combined rostral crown and laurel wreath, that of Augustus bare. Reverse: COL - NEM to left and right of palm-shoot, its tip to right, behind chained crocodile; above palm-tip, two wreaths with long ties. Reverse: COL - NEM (NE ligate) to left and right of palm-shoot, its tip to right, behind chained crocodile; above palm-tip, two wreaths with long ties. Reverse: COL - NEM to left and right of palm-shoot, its tip to right, behind chained crocodile; above palm-tip, wreath with long ties. 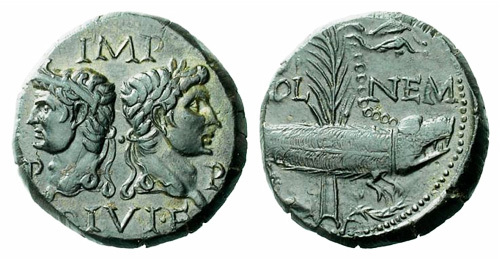 Obverse: IMP/DIVI F, Heads of Agrippa to left and Augustus to right, back to back, that of Agrippa wearing combined rostral crown and laurel wreath, that of Augustus laureat, P - P to left and right of the heads. Reverse: COL - NEM to left and right of palm-shoot with short, dense, fronds and its tip to left, behind chained crocodile; to left of palm-tip palm-tip, wreath with long ties. Reverse: COL - NEM to left and right of palm-shoot with long, vertical, fronds and its tip to left, behind chained crocodile; to left of palm-tip palm-tip, wreath with long ties. Reverse: COL - NEM (NE ligate) to left and right of palm-shoot with long, vertical, fronds and its tip to left, behind chained crocodile; to left of palm-tip palm-tip, wreath with long ties.